Wagga Wagga claims a diverse cultural heritage and rich background. Our unique history, shaped by Indigenous ownership and European settlement, has helped make the city of Wagga Wagga the quintessential Australian town. The area of land that came to be known as Wagga Wagga was home to the Wiradjuri people, a large indigenous population that spanned much of New South Wales. The land was rich in wildlife, particularly bird life, with black swans, pelicans, emus and larks inhabiting the grass plains and numerous waterways in significant numbers. In December 1829, the early colonists first sighted the land on which the flourishing City of Wagga Wagga now stands. The persons thus privileged consisted of Captain Charles Sturt, 39th Regiment, stationed in Sydney, Mr George Macleay and six others. This party passed over the site of future Wagga Wagga on its expedition of discovery down the Murrumbidgee and Murray Rivers. Settlement swiftly followed. Wagga Wagga was proclaimed a town in 1849 and in the same year surveyor Thomas Townshend marked out the town. In the 1860s the population totaled approximately 700, but by 1881 it had increased to 3,975. In 1879 the railway line was extended south of the river. The name of the City is derived from the language of the Wiradjuri tribe, which was the biggest aboriginal tribe in New South Wales, embracing the Riverina area. Wagga Wagga is 518km by rail from Sydney and 432km from Melbourne on the main Southern line. It is 180m above sea level at the Council Chambers and situated on the Sturt Highway, which joins the Hume Highway 48km to the east. It is the junction of the Sturt Highway and the Trunk road known as the "Olympic Highway", which enables travellers by road to proceed to and from Sydney via Cootamundra, Cowra, Bathurst and The Blue Mountains area, instead of traveling via the Hume Highway. The City, incorporated as a Borough in 1870 and proclaimed a City in 1946, has an area of 488,600 hectares, and at 30 June 1998, an estimated population of 58,000. On 1 January 1981 the existing City of Wagga Wagga became amalgamated with the adjoining Shires of Kyeamba and Mitchell. See a timeline of Wagga Wagga's most significant dates. A picture of life in the New South Wales town of Wagga Wagga in the mid 1960s. Made by The Commonwealth Film Unit 1966. Directed by Rhonda Small. Part of the Life in Australia series The Commonwealth Film Unit turned it's cameras on Wagga Wagga, midway between Australia's two largest cities Sydney and Melbourne, as an example of an Australian Regional city with an eye to the future. Gazetted as a village in November 1849, Wagga Wagga was, in 1999, the largest inland city in New South Wales. However Sherry Morris' history does more than simply chart developments between 1849 and 1999. It also embraces the history of the region from prehistoric times to white settlement and includes the history of the Aboriginal people who lived in what later became the local government area of Wagga Wagga. The attention this work gives to Aboriginal and to women's history reflects the concerns of social historians at the end of the twentieth century. 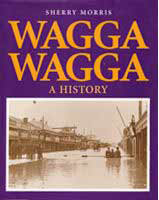 Wagga Wagga - A History is available for purchase from the Museum of the Riverina or for loan from Wagga Wagga City Library.